Anyways, on with this field test shooting review... As per my normal field test shooting reviews, I shoot some rounds through my Chronograph to get an average fps rating and I also step back 30 feet from a paper target and use a semi rested position to place a series of rounds downrange. I decided to allocate 8 rounds for each test station since the magazine holds 8 rounds on each end. During my Chrony test the ASG CZ P-09 Duty started out in the high 300's and then dropped to the low 300's with an average 8 shot velocity of 334 fps. From the 30 foot mark I was impressed to see 7 of my 8 shots to all hit within 1 inch of each other while the oddball got away a bit and extended the grouping out to about 2 inches. The ASG CZ P-09 Duty CO2 Blowback Pellet-BB Pistol did shoot a hair low and to the left a bit but not too extreme. All in all the blowback is fairly heavy, at least enough to shake the front sight around so much that it almost fell off the gun so be careful of this and perhaps super glue yours in before you lose it somewhere. 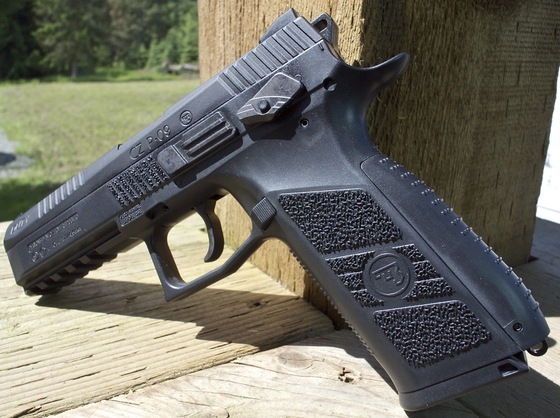 The trigger on the CZ P-09 Duty is pretty much the same as all the other blowback rotary mag pellet airguns on the market, kind of long but not too heavy yet still very usable.